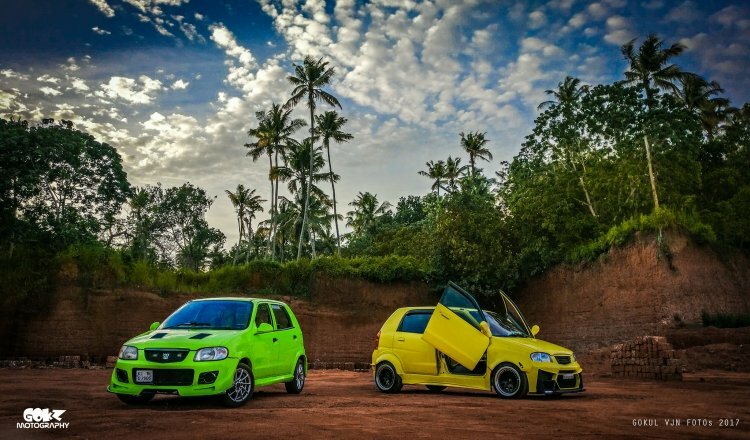 The Facebook page Gokz Motography has shared images of a pair of custom previous gen Maruti Altos from Kerala called Eva and Mr. Yellow. The modified Maruti Suzuki Alto pair features exterior changes along with rather loud paint jobs. The one finished in green has been christened Eva while the one in yellow is called Mr. Yellow by their respective owners. 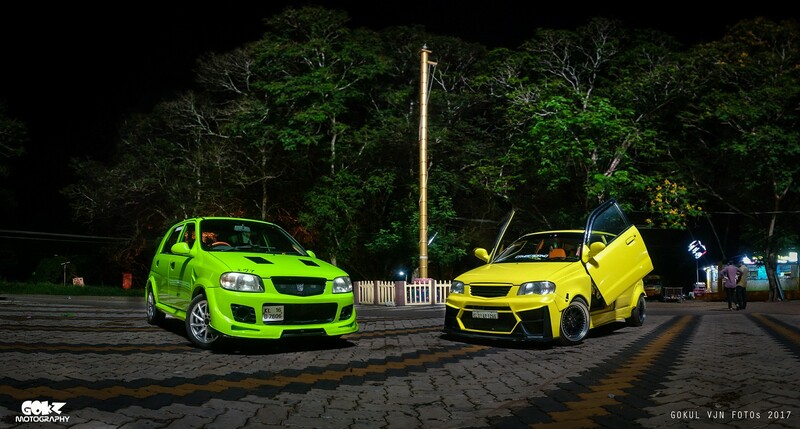 Mr. Yellow finished in fluorescent yellow features a body kit that adds flared wheel arches, a front bumper with a very angular design along with a splitter finished in black. The front bumper also features LED lighting. The highlight, however, is the scissor doors. The rear also gets a new bumper as part of the kit complete with faux air intakes and rear diffuser. There's a dual exhaust setup, and red tinted tail lamps are the back. The custom Maruti Alto rides on oversizes, black-chrome alloy wheels. It wears an Autobots badge from the Transformers franchise. The other modified Maruti Alto here is called Eva. It is finished in a fluorescent green shade. Unlike the yellow one, this one features a more subtle body kit with flared wheel arches and straightforward bumper extensions. The owner, presumably a Transformers and Ken Block fanboy, has put Decepticons' insignia on the front grille and "Hoonigan" lettering on the rear windows. This pair of modified Maruti Altos hails from Kerala and features body kits, lowering springs, scissor doors and performance exhaust. A video shared on the page outlines other mods include an HKS exhaust system and lowering springs. There is no mention of the engine outputs.